A Czech developer is attempting to sue the agency. A CZECH DEVELOPER has brought a court case alleging that they were locked out of negotiating for a contract by a Nama-backed developer. 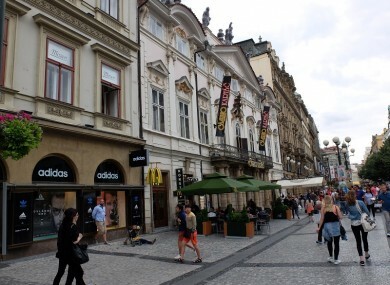 Flow East, a Prague developer which specialises in the restoration of historic buildings, has filed two court actions alleging “improper process” and “breach of good faith” in the pending sale of the Savarin Palace shopping centre project by Ballymore Properties to Crestyl Developments. The developer says it was invited to bid for the Savarin Palace project in the Czech capital late last year, bidding €1.5 million over the guide price of €80 million. Savarin Palace is owned by Ballymore Group, which has loans in Nama. Flow East says that Nama’s relationship with the developer is unclear, claiming that the sale documents outlined that the agency would be disposing of the property. Simon Johnson, who is the Chief Operating Officer of Crestyl Developments, worked for Ballymore as their Country Director in Slovakia, immediately before making the move to Prague. Additionally, Flow East claim that in February they were dropped from the bidding roster by Ballymore after they were allegedly told they would have exclusivity over the deal. Chairman James Woolf says that the deal had been legally agreed. ‘We feel that the tender for Savarin Palace project has been less than fair. No-one has been able to explain why our status as preferred bidder was suddenly rescinded. The relationship between Ballymore, NAMA and Cushman & Wakefield is obscure: who is the actual vendor? Common sense tells us that it is NAMA, but this is denied. Flow East says that having delivered the highest confirmed bid, they were in the position to deliver the best return for Irish taxpayers. Nama told Flow East that they were only concerned with Ballymore’s loans, Woolf claims. A spokesperson for Ballymore hit back, saying that Flow East’s bid came with onerous conditions. Ballymore hired Cushman & Wakefield one of the most respected estate agents in Eastern Europe to run the sales process in an open market process. They recommended excluding Flow East from further participation in the sales process as the conditions they attached to their bid were unacceptable. In addition Flow East backers pulled their support. For these two reasons Cushman & Wakefield recommended excluding Flow East and we accepted their recommendation. A Nama spokesperson said that it does not discuss individual debtors. Email “The curious case of a palace in Prague, an Irish company and Nama”. Feedback on “The curious case of a palace in Prague, an Irish company and Nama”.